The head of a trail-blazing agricultural supply chain solutions company and the joint CEOs of an influential Australian small business lender have been crowned by their peers as Australia’s fintech industry leaders for 2017. In addition, a company which is revolutionising Australia’s retail environment by giving customers a “buy now, receive now, pay later” service has been named as Australia’s FinTech Organisation of the Year. The winners of the inaugural Finnie awards were announced on 24 May at a gala ceremony attended by more than 200 guests at Sydney’s Darling Harbour. The winners of 29 awards were chosen by 39 local and international judges from 158 entries. You can download the full list of winners here. Awards were also handed out for companies that have shown excellence in 17 fintech sub- sectors, along with a further seven awards in areas such as workplace diversity, collaborative partnerships, market presence and marketing. Afterpay caught the attention of judges for its retail transaction solution which allows customers to buy and receive a product and then pay for it in four fortnightly instalments. Judges were impressed with the “strong customer centric” solution and the fact that Afterpay had attracted “independent private sector bank financing”. AgriDigital is a global commodity management and financing solution for all stakeholders along the agriculture supply chain. In December 2016, AgriDigital successfully executed the world’s first-ever live settlement of a physical commodity on a blockchain between a grower and a buyer. Prospa provides unsecured loans of up to $250,000 that can take as little as 30 minutes from application to money in the bank. In its fifth year of operation, Prospa has more than 10,000 customers and is approaching $350 million in loans to small businesses. FinTech Australia President Simon Cant said he was delighted with the quality of entries and winners in the first industry-backed awards to be held in Australia. “Tonight’s awards showcase the excellence in Australia’s fintech industry and will help promote this industry to a broader audience, assisting it to grow in a highly globally- competitive environment,” he said. 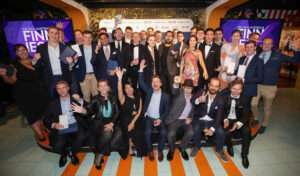 “The winners are a testament to the dynamic and exciting Australian fintech environment which has come a long way in a few short years and has almost unlimited potential. A total of 19 of the 29 Finnie award winners are from NSW, underlining the strength of the state’s local fintech industry. Deputy Premier and Minister for Small Business John Barilaro said: &quot;The NSW Government through Jobs for NSW has been very pleased to sponsor the Finnie Awards over two years to celebrate the achievements of our fintech sector, and I congratulate all the companies and individuals who have been recognised for their incredible work. NSW Minister for Innovation Matt Kean said: “Sydney is home to Australia’s largest financial services industry and a leading Asia Pacific fintech hub with 54 per cent of our fintech sector based in NSW, including 8 out of 9 Australian fintech startups on the Fintech 100. We are committed to growing this exciting high-value growth sector to create jobs and economic opportunities for our state”.